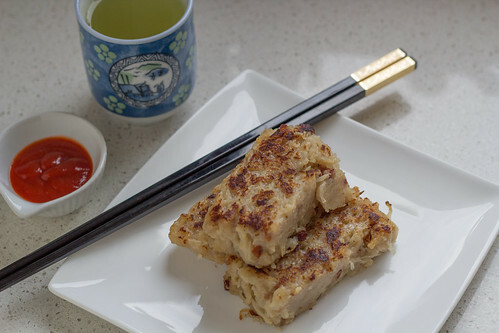 Every time go have Yum Cha, I have to order Lo Bak Go (Turnip Cake). It’s been a favourite of mine ever since I was young . Since I seldom have Yum Cha now, I thought what a perfect opportunity to make my favourite Yum Cha dish. I have found a lovely recipe from Saucy Spatula that has amazing Cantonese/Hong Kong recipes which I’ve tweaked slightly to my liking. 1. Soak the dried shrimp in warm water for about 10 minutes or until soften, then discard the water and dice. 2. Dice the Chinese sausage. 3. Wash, and cut both ends of the daikon, then peel. 4. Finely grate the daikons. 5. 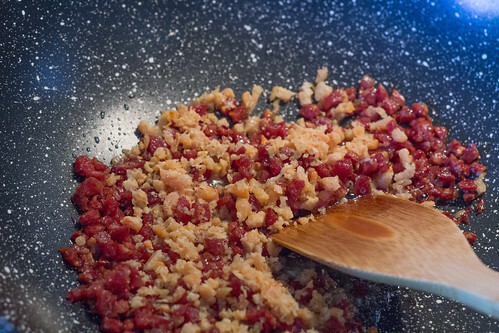 Cook the Chinese sausage then toss in the dried shrimp, stir-fry for about 10 minutes until golden brown and set aside. 6. 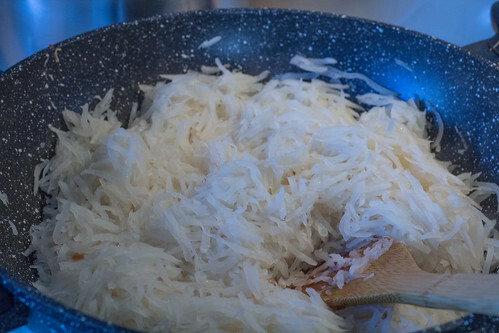 In a large wok, add in the grated daikon and fry for around 20 minutes and drain off as much liquid as possible and save it for later use. If your daikon does not release much liquid, top it up with water. 7. 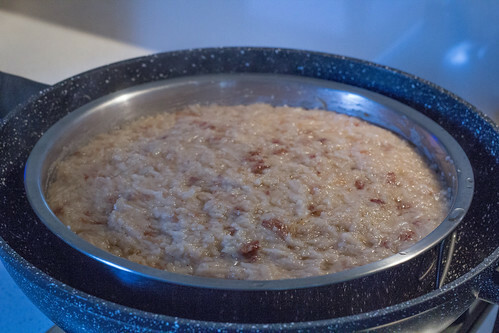 Combine the rice flour, black pepper, white pepper, sugar, salt and soy sauce with the saved liquid/water until the flour is dissolved and all other ingredients are well mixed together. 8. 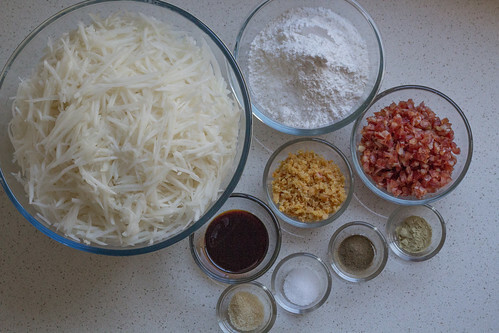 Add in the Chinese sausage and dried shrimp to the daikon and mix well. 9. 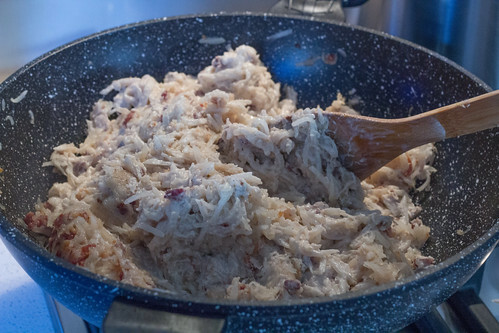 Add in the rice flour mixture to the daikon batter and keep stirring to combine. 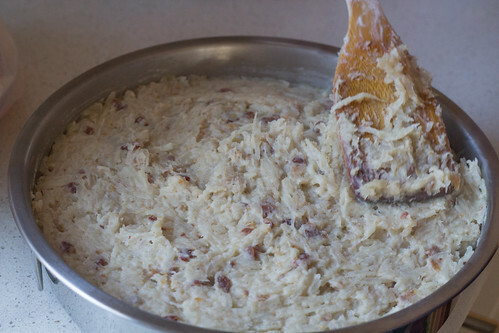 After the daikon batter is mixed, the mixture should be “doughy” and dense. 10. Steam the batter for an hour in a heat-proof container. Make sure that it can fit in a wok with the lid on. 11. 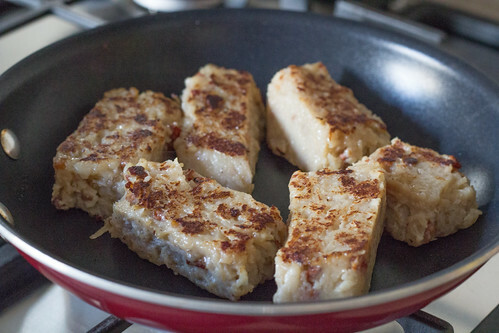 After an hour, the Turnip Cake is done. Let it cool and the cake will become more firm. 12. Place in the fridge overnight. 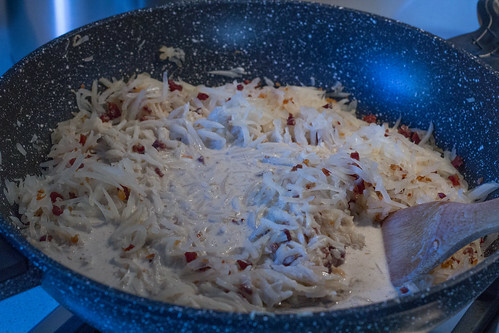 To cook, make 1.5 cm slices and pan-fry until golden brown on both sides. Popular Cantonese Yum Cha/Dim Sum dish made of shredded daikon and rice flour. When served fresh from the pan, it has a lovely fried radish aroma that you cannot mistake. Soak the dried shrimp in warm water for about 10 minutes or until soften, then discard the water and dice. Wash, and cut both ends of the daikon, then peel. 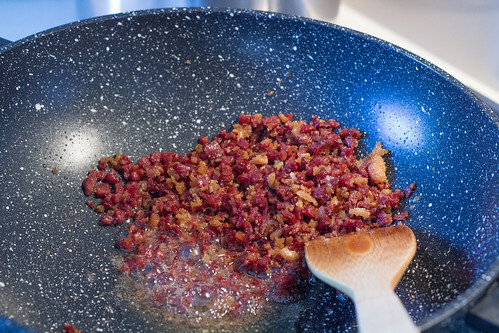 Cook the Chinese sausage then toss in the dried shrimp, stir-fry for about 10 minutes until golden brown and set aside. 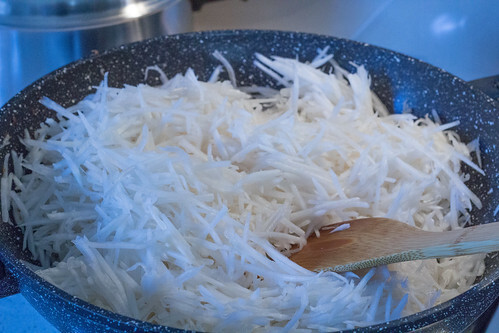 In a large wok, add in the grated daikon and fry for around 20 minutes and drain off as much liquid as possible and save it for later use. If your daikon does not release much liquid, top it up with water. 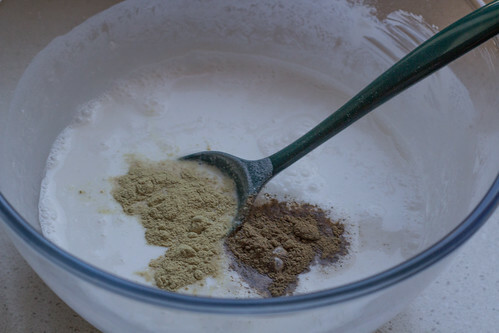 Combine the rice flour, black pepper, white pepper, sugar, salt and soy sauce with the saved liquid/water until the flour is dissolved and all other ingredients are well mixed together. 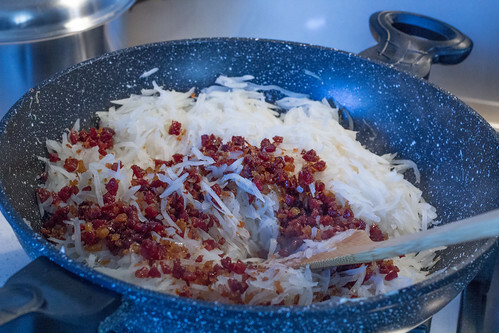 Add in the Chinese sausage and dried shrimp to the daikon and mix well. 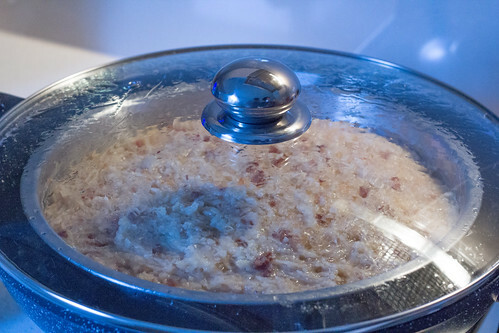 Add in the rice flour mixture to the daikon batter and keep stirring to combine. 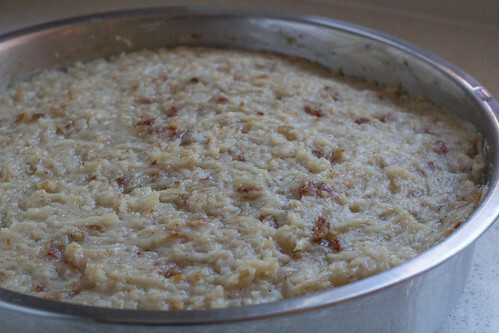 After the daikon batter is mixed, the mixture should be “doughy” and dense. 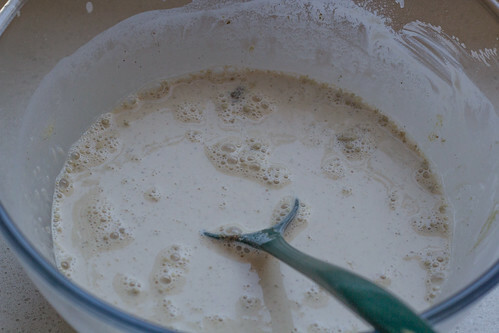 Steam the batter for an hour in a heat-proof container. Make sure that it can fit in a wok with the lid on. 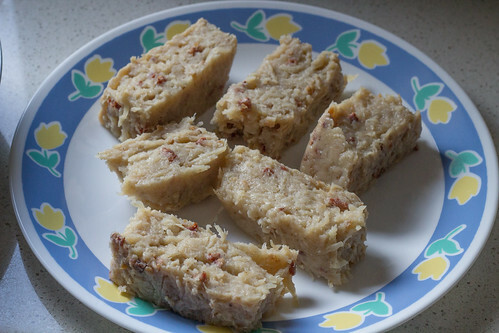 After an hour, the Turnip Cake is done. Let it cool and the cake will become more firm. Place in the fridge overnight. To cook, make 1.5 cm slices and pan-fry until golden brown on both sides. 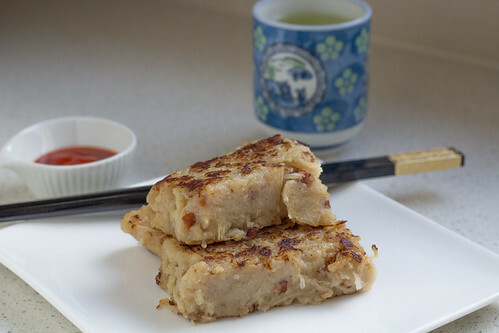 If you prefer your turnip cake to be softer in texture, add an additional 3/4 cup of the daikon liquid/water to the mixture. If there isn't enough liquid released from the daikon, top it up with water.